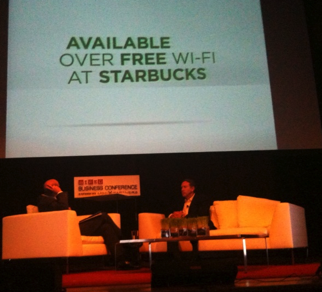 At Wired’s Business Conference in New York City, Starbucks’ Howard Schultz announced that the coffee giant is now offering free Wifi to customers beginning July 1. Currently, you can connect to AT&T WiFi in Starbucks stores, which is free for two hours if you have a registered Starbucks card. And if you are an AT&T customer, you can access connectivity in coffee shops for free. If you’re not a registered Starbucks or AT&T customer, you have to pay $3.99 for two consecutive hours of Wi-Fi access. Starbucks is partnering with a number of media companies, including Yahoo, for this new digital venture. When you go to Starbucks and log-in to wifi, you’ll be served with targeted content and news. Yahoo will help run the portal and Starbucks is also working with AOL to integrate local content from Patch in the network. And you’ll get free versions of content from WSJ, Zagat, New York Times, USA Today, and free pick of the week iTunes download. Additionally, there will be no advertising on Starbuck’s digital portal.